Anita Marshall’s weight loss journey is definitely inspiration. After spotting a before-and-after photo of her floating around on Twitter, I just knew she would be perfect for our Fit Monday feature. Ever since she was younger, Anita had dreams of becoming a model, however, those dreams were almost crushed when she auditioned for America’s Next Top Model and was told that she was too big to fit their modeling criteria. Although it was a huge blow to her self-esteem, Anita decided that she was not going to let her weight hold her back from achieving her goals. 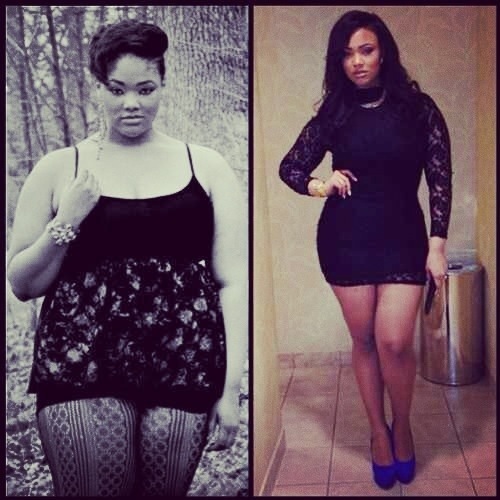 Weighing in at almost 300 lbs, she decided that it was time that she took control of her destiny and she found the motivation to start working out and eating healthy. Fast forward to three years later, and she has now lost the excess weight and is currently a professional plus-size model with a booming career (Take that ANTM!). Anita can now be seen on the cover of magazines, Macy’s ads and much more. Years ago I started a journey to be a happier me. I was miserable. I hated what I was. I was angry at the world and didn’t feel like I had a purpose. One day I woke up and told myself I would stop feeling sorry for myself. I realized if I didn’t take control of my health, I would die from either the diabetes or heart disease that runs in my family. ( I want) to continue this journey of a happier and healthier me. We recently caught up with Anita, and she was nice enough to share with us her weight loss journey, as well as her current workout regimen and nutrition plan.